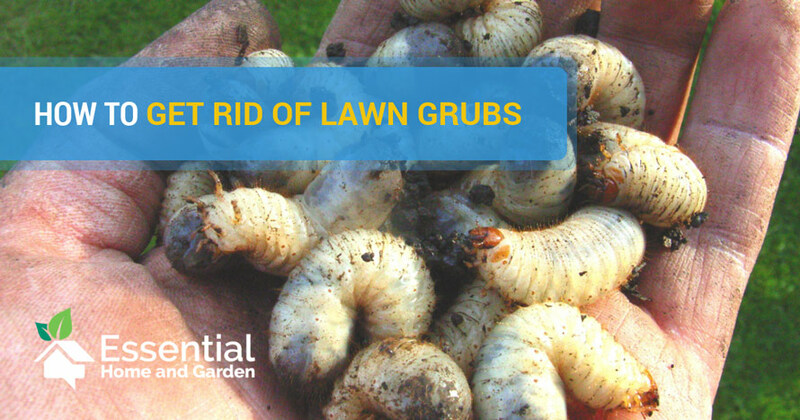 Having grubs in your lawn or garden can be a right pain in the proverbial backside. Just knowing they are there in the first place if difficult, as the signs of having grubs can be very similar to other common problems. And when we do know that they are there – how do we get rid of them? Knowing how to get rid of grubs starts with having a little information under your belt, so you know what you’re looking for and the best approaches for defeating these lawn-killing pests. First of all, what are “grubs”? It’s a pretty general term and can refer to a number of different kinds of thick, worm-like beetle larvae that live in your garden soil. They exist as dormant eggs through the cold winter months, and then hatch in the spring to burrow around and eat the roots of your plants. Eventually, they will change into their adult forms and lay more eggs that hatch into next season’s grubs, starting the cycle all over again. Some species can take more than 1 year to complete the cycle, but the idea is the same. So how do you know you have grubs? Your first signs are likely going to be problems with your grass and other plants. Odd patches of grass will start to die off and turn brown, without any apparent cause. 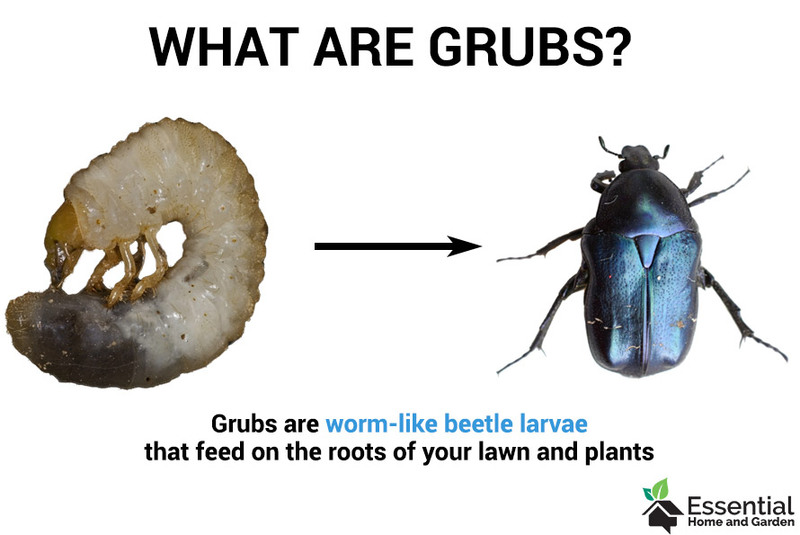 If you do have a grub problem, the damaged grass should pull up easily since the grubs have been eating away the roots underneath. Once you can see the dirt, you should have a clear view of any grubs. They don’t burrow too deeply Depending on the specific species (we’ll get to that in a moment), they’ll be an inch or so in length, cream-colored with a dark brown head, and usually curl up in a “C” shape when the sod is pulled off. Another tip-off that you have a grub problem is the increased activity around your yard from raccoons, skunks or birds. These animals love to eat grubs, and will come in droves for the easy snacks. So finding patches of sod all torn up and dug through can mean you have grubs, even if they’re not the ones who directly did the damage. For more specific species identification, it gets a little tougher. We’ll discuss the different kinds of grubs in the next section. 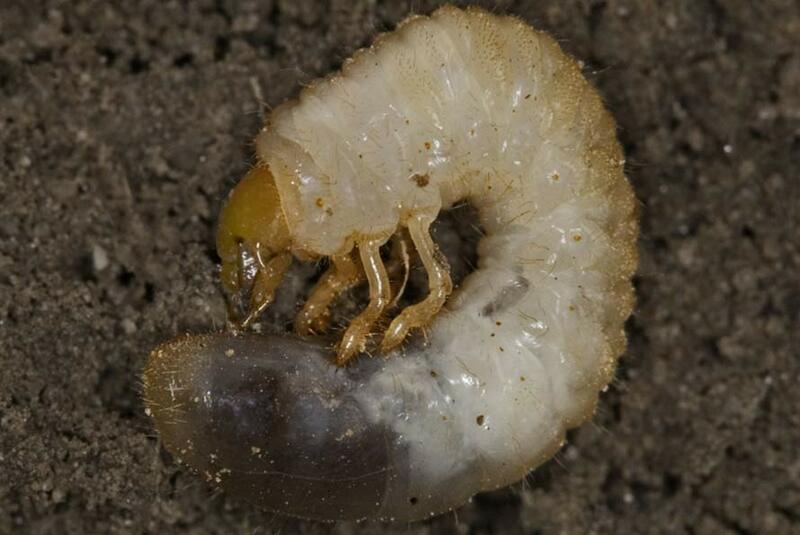 In North America, you’ll likely be finding grubs from a few different families of beetle. June beetles (also called June bugs or even May beetles) are the most widespread, but you may also have Oriental beetles or European chafers. They all look very similar when in the grub stage and most home gardeners aren’t going to be able to tell one from the other without a little research and possibly an insect identification guide. While technically there are some species of grubs that are harmless to your grass, most will be a problem. If you see grubs in the dirt without any actual damage going on, you might want to wait and see what develops before you reach for the insecticide. Now we can get to the important details on how to get rid of grubs. You have two general options: pesticides or a more natural route. One point to mention before you go to war on the grubs, they are a natural part of the ecosystem and you shouldn’t necessarily worry about them unless there are large numbers. If you check under the grass for about a square foot, and only find 5 or 6 grubs, then you can just leave them alone. They aren’t going to cause much of a problem. For commercial pesticides, you have a few choices. Most will come in either liquid or granular form, and can contain compounds like carbaryl, imidacloprid, or halofenozide. These are known as “curative” products as they are designed to kill existing grubs. You’ll have to check with the instruction on the how and when to apply because not all products target grubs at precisely the same stage. That means some may be put out on the lawn later in the season than others. Check the labels. Take note that even though chemical products might seem more effective, they will kill a lot more than just the grubs. That can have a negative effect on the health of your lawn since there are so many beneficial insects living down there as well. I have had great results with Bayer Advanced Grub Killer. Give it a go! If you want ideas on how to get rid of grubs naturally instead, there are effective ways to take that approach. One of the most popular is to introduce parasitic nematodes into your lawn, which can be purchased online or at garden stores (they’re alive, so buy right before you plan to use them). They sound a little scary but they are just microscopic organisms and are harmless to anything but a grub. Milky spore is another natural bacteria that can help if you are dealing with Japanese beetle grubs specifically. Another simple way to kill off grubs is to let them dry out. They only thrive in moist soil and will die during a drought. Avoid watering the grass and you might find that is enough to kill them. Granted, it may not be the best choice for the grass but many species of grass will bounce back after a dry spell. Timing can be important too. Spring and early summer can be the best time to target a grub infestation, as they are the most vulnerable then. Once they are in their hard pupae casings, they are much harder to kill. And of course, when they are in their adult phase, they aren’t under the ground any more and will require different tactics. While pesticides and natural methods can get rid of the majority of grubs, it is inevitable that some will remain. If you find a grub here or there when working in your yard, don’t stress too much. It is highly doubtful that you will ever be 100% grub free. As long as there are no signs of problems, you can rest easy. Sometimes the best way to get rid of lawn grubs is to keep them out of your soil in the first place. That means targeting the adult beetles before they have a chance to lay their eggs. When they are in their adult beetle form, they are dealt with just like any other above-ground garden bugs. Usually, a standard insecticide will work. Even a natural repellent with pyrethrins can be enough to deter the beetles from spending time in your yard and laying their eggs. You can even go old-school and use the pick-and-crush method to kill off any of the large beetles you see in your yard. If you can’t get a handle on your grubs this way, there are also commercial preventative products you can buy that contain many of the same chemicals as the grub-killers. These are intended to either kill/repel the adult beetles or kill the eggs before they hatch, and are labelled as “preventative” control products (as opposed to the previously mentioned curative products). So next time you have to deal with lawn pests, now you know how to get rid of grubs. Types Of Paint Sprayers – Which Is Right For You? 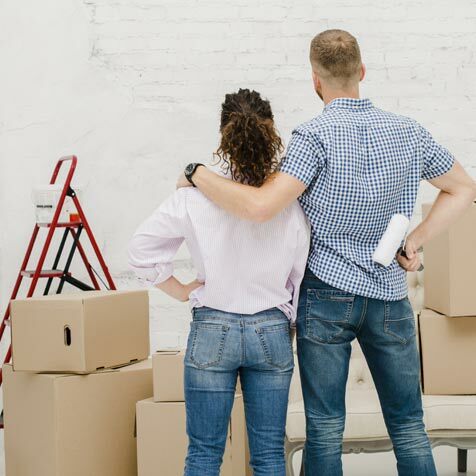 Home Insurance vs. Home Warranty: Which Is Right For You?